The first 50 sold will come with a limited edition 'White Hoarhound' 15cm x 5cm (rough edged) patch; screen printed silver ink on 195gsm black fabric and an exclusive design only available from Alunah! 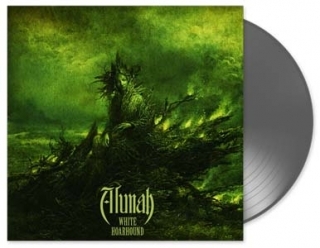 Originally released in 2012 (CD) on PsycheDOOMelic and 2013 (vinyl) on Napalm Records, Alunah's second album "White Hoarhound" is getting a vinyl re-release. On its 5 year anniversary, Catacomb Records have joined forces with HeviSike Records to re-release it with new artwork; limited to only 300 copies. Recorded by Greg Chandler at Priory Recording Studios, England, and re-mastered for vinyl by Tony Reed at HeavyHead Recording Co., WA, USA.